Lager carries the can for loutish behaviour | LAGER FRENZY! On busy streets, in the subways below and amid the tight, after-work squeeze on commuter trains, a menacing, befuddled and reeling regiment is on the attack. Its young members, emboldened by alcohol and loosely allied by behavior, are known as ”lager louts” and are being accused of sexual assault, harassment, disorderly conduct and other offenses. As they struggle to vanquish their morning-after haze, the British Government, police and local authorities are marshaling their forces to defeat them. 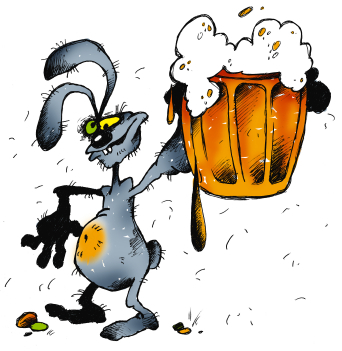 The Daily Mail even ran a campaign against rampaging rabits boozed up with lager. No, honest. Bloody hell, sounds like the opening scene of ‘Dawn of the Dead’. But no, the above quote is from The New York Times, October 31 1988, the height of the ‘Lager lout’ panic of the late-eighties. I’ve been looking at news stories from 1988 and 1989 and the birth of the lager lout phenomenon, and the bile and venom served up by newspapers – broadsheet and tabloid alike (when it used to make a difference) – is remarkable. Especially when several academic studies suggest that the link between crime and alcohol is not as clear cut as the tabloid journalists would have it. Roger Birch, chairman of the Association of Chief Constables, is credited with adding fuel to the ‘Moral panic’ by announcing to the association’s annual conference that Britain’s police forces were now so undermanned that they were “losing control on the streets”. The drinks industry made attempts to clear its name – a Gallup survey for Miller Lite revealed that the youth were not drinking as much as everyone assumed and bought on average a mere four cans of beer a week. Mind you if they were buying Miller Lite, perhaps the low number is understandable. The real villains of course were the advertisers who were blamed for forcing the poor innocent drinkers to swap the good honest pint of real ale for lager “by the shameless creation of an in-crowd mentality which permeates almost all of the lager advertisements we see on television”, according to the Sunday Times. So as the UK politicians again turn their focus on beer in the form of binge drinking, you can look back nostalgically to the louts of the 1980s and fast forward to the future. This entry was posted in Beer, Lager and tagged binge Britain, drunken rabbit, lager lout, moral panic. Bookmark the permalink.